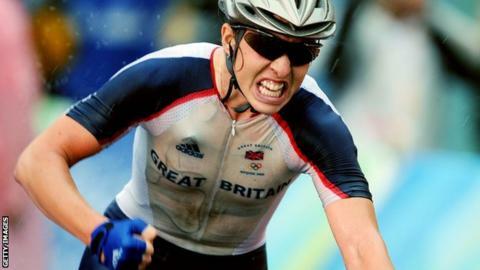 Former Olympic champion Nicole Cooke says it is a "scandal" there is no longer a Tour de France for women, blaming sexism in cycling. The men's race, which starts in Leeds on Saturday, is now an iconic event, but the women's Tour last ran in 2009. Britain's Cooke, who won the women's Tour in 2006 and 2007, said: "It's the sexist nature of those running the sport that allowed it to happen." The women return to the Tour this year for an elite La Course race. They will compete on the final stage of the Tour a few hours before the men's peloton arrives in Paris. Former world champion Cooke, who is now retired, says the inaugural event is a "tiny step" in the right direction, but insists there is still a long way to go to restore the standing of women's cycling. "It's a scandal there isn't a Tour for women at the moment," the 31-year-old said in an interview with BBC Breakfast. "In the 1980s, there was a women's Tour de France. It was held over the same stages as the men's race. They celebrated with equality. "Since then, women's cycling has kind of been swept under the mat." The women's Tour has been staged on and off, in numerous guises, since 1984 and was won by Cooke in 2006 and 2007. It began life as the Tour de France Feminin and was rebranded the Grande Boucle in 1998, but has slowly dwindled in size. The final race in 2009, won by British rider Emma Pooley, was only four days long after a planned start and three stages in Britain fell through. Cooke, who became the first cyclist to win Olympic and world road race titles in the same year in 2008, retired from cycling in 2013.